The Facebook pages for two of my three upcoming books are now online. They’re new, and I’m still moving in, but please feel free to “like” those pages. By doing so, you will receive periodic updates on the progress of each book, as well as release dates, signings, and other events! Just click on the title. 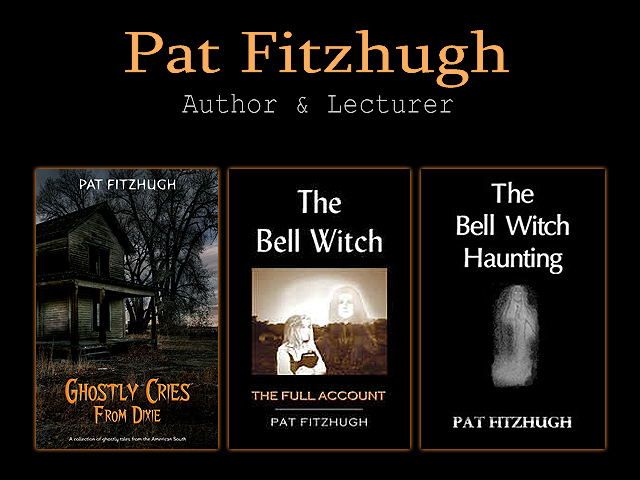 Posted in author, book promotion, Books, e-books, Forthcoming Titles, Ghosts, Halloween, Historical Fiction, Paranormal, short stories, Storytelling and tagged ghosts, haunted, historical fiction, Natchez Trace, paranormal, spooky, storytelling on November 19, 2014 by Pat Fitzhugh. I hope everyone had a great Halloween and is enjoying this creepy fall weather. I’ve been involved with several projects as of late, one of which is more ghost hunting and paranormal investigation. If you write books about ghosts and the paranormal, you need to live the part. Right? I’ve been to several places over the past year, most notably The Thomas House in Red Boiling Springs, Tennessee. Why there? Why so many times? That’s because it’s one of those places where you will always be guaranteed action. I like action, lots of action. With its sordid past, the place stays active around the clock, every day. It’s also a short drive for me, the overnight room rates are cheap, the food is great, and the place makes an excellent getaway for reading, writing, or just relaxing and rebooting the old mind. It should come as no surprise that I am including The Thomas House in the sequel to Ghostly Cries From Dixie, which I am currently working on. The sequel, still unnamed but using “MORE Ghostly Cries From Dixie” as its working title, will be released in the spring of 2015. As was the case with its predecessor, it will be a compilation of weird and ghostly tales from the South. Sound easy? Given the South’s reputation for haunted places and campfire tales, one would think it easy to find plenty stories for the book. Not so. Finding ghost stories for inclusion in a book is one the hardest projects I’ve ever worked on. The story needs to be rich enough in history to create a backdrop and backstory, yet creepy enough to be consistent with the book’s theme. Well-grounded ghost stories, especially those from the South, contain not only spooky elements, but also a strong sense of place. During my search for bookworthy ghost stories from the South, I kept finding stories from the Natchez Trace, a footpath through the Mississippi, Alabama, and Tennessee wilderness back in the late 1700s and early 1800s. Apparently, some of the early travelers along the old path, who never made it home, are still wandering up and down the trail or lurking in the nearby woods after more than 200 years. There were a few Native American attacks, a couple disease scares, and a handful of natural deaths, but most of those who died on the Natchez Trace were murdered by outlaws and bandits. Money was not always the motive. Some “land pirates,” such as the Harp Brothers, killed people just for the sake of killing. They thought it was fun. The Natchez Trace is full of history, outlaw stories, and ghosts. So, guess what? In addition to the “Ghostly Cries From Dixie” sequel, I am also writing a book about the infamous ghosts and bandits of the Natchez Trace. Look for it in the summer of 2015. Also, at some point, I will hopefully get From Turkey Creek – A Memoir and the Bell Witch update book done as well.